To configure and manage users in Microsoft® Lync® Server 2013, you can use a variety of methods. Lync Server 2013 provides configuration management options, including Lync Server Control Panel and Lync Server Management Shell. You can use basic syntax for working in Windows PowerShell because it has powerful scripting capabilities. You can also use the administrative model of the new role-based access control (RBAC) in Lync Server 2013. The administrative model provides predefined roles, which you can assign to administrators, and you can create new custom roles. address, or line Uniform Resource Identifier (URI). You can then use the results of your search query to configure users for Lync Server 2013, and perform other related tasks such as assigning policies, and changing or removing personal identification numbers (PINs). • Enable or disable users. After you create a user account in Active Directory® Users and Computers, you can enable or disable a user account in Lync Server 2013. When you disable a previously enabled user account, you do not lose the Lync Server 2013 settings that you configured for that user account. Therefore, you can choose to re-enable the user without reconfiguring the user account. conferencing policies, supported client version policies, archiving policies, or remote user access policies. • Assign users to a server or pool. You can assign users to a server or move them to a specific pool under the Edit or move users link in the Lync Server Control Panel. • Set a user’s dial-in conferencing PIN. You can configure global PIN policies, such as the required minimum length. In addition, you can configure PIN policies for individual users or sites. You can choose to generate the PIN automatically, or create one manually. Lync Server Control Panel is automatically installed on every front-end server or Standard Edition server in your deployment. In Lync Server 2013, Edge Servers are managed remotely by using the Lync Server Control Panel, which is not exposed externally to the web. Note: You cannot use Lync Server Control Panel to manage users who are members of the Active Directory Domain Admins group. For Domain Admin users, you can use Lync Server Control Panel to perform read-only search operations. To perform write operations on Domain Admin users, such as enabling or disabling Lync Server 2013, or changing pool or policy assignments, telephony settings, SIP address, and so on, you must use Windows PowerShell cmdlets while logged on as a Domain Administrator with appropriate RBAC credentials. Management Shell is up to you—you can perform all Lync Server 2013 management tasks by using either tool. One advantage of the Lync Server Management Shell is that it is useful for running scripts to automate common administrative tasks. Lync Server Management Shell is automatically installed on every Lync Server Enterprise Edition front-end server or Standard Edition server in your deployment. The Management Shell is built on the Windows PowerShell 3.0 command-line interface, and it includes more than 550 product-specific cmdlets for administering Lync Server 2013. Each PowerShell cmdlet (pronounced “command-let”) consists of a term (typically a verb) followed by a dash, and then followed by a noun as shown in the following example. Typing “new” conveys to PowerShell what you want to do. The dash-noun combination signifies a parameter. In this example, PowerShell creates a new collection of user replicator configuration settings. The user replicator periodically retrieves up-to-date user account information from Active Directory and then synchronizes the new information with the current user data stored by Lync Server 2013. Because both the Lync Server Management Shell and the Lync Server Control Panel are built on the Windows PowerShell 3.0 command-line interface, being comfortable in working with the syntax and capabilities of PowerShell is important. If you are new to PowerShell, but familiar with scripting, an overview of how to use PowerShell 3.0 with Lync Server 2013 will be helpful. runtime (CLR), and PowerShell accepts and returns .NET Framework objects. By using product-specific commands, PowerShell gives you access to the file system on the computer and enables you to access other data stores, such as the registry and the digital signature certificate stores, just as easily as you can access the file system. It is designed specifically for systems administrators to make configuration and management tasks easier. As previously mentioned, each PowerShell cmdlet consists of a verb followed by a dash, and then followed by a noun as shown in the following example. If you want to receive help on a specific cmdlet, type the following. This command returns the most commonly-sought help for creating a new voice policy. For more detailed help on a topic, you can add a parameter, preceded by a dash, as shown in the following example. For all available help on a topic, use the parameter –Full. Lync Server 2013 Help file. There are two specific Help files available for cmdlets—RTCCmdlets.chm and RGSCmdlets.chm. information that is returned. For example, if you want to find all the services running on a particular server, type the following command. granted to users by assigning administrative roles to them. 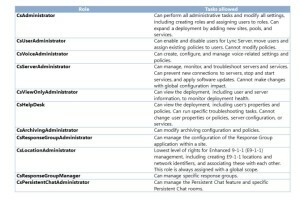 Lync Server 2013 includes a rich set of built-in administrative roles. You can also create new roles and specify a custom list of cmdlets for each new role, and you can add scripts of cmdlets to the allowed tasks of both predefined and custom RBAC roles.